Youth is best understood as a period of transition from the dependence of childhood to adulthood’s independence. That’s why, as a category, youth is more fluid than other fixed age-groups. Yet, age is the easiest way to define this group, particularly in relation to education and employment, because ‘youth’ is often referred to a person between the ages of leaving compulsory education, and finding their first job. Before all of this, it is important for a child to express themselves as individuals and explore the world they live in before adolescence occurs. The Port Authority® Youth Silk Touch™ Performance Polo comes in a variety of colours for you to choose from, including: Black, Bright Purple, Brilliant Blue, Carolina Blue, Dark Green, Maroon, Navy, Pink Raspberry, Red, Royal, Steel Grey and White. It weighs 3.9 ounces which is a suitable weight for a youth to enjoy their activities and experiences on a day-to-day basis. This polo is made out of 100% cationic polyester and is double knit to ensure maximum comfort. It’s self-fabric; tag-free label guarantees a smooth feel, where the silk is ill-affected by any interruption to their day by itchy tags etc. Also included is a 3-button placket with dyed-to-match buttons. A distinct feature is the open cuff sleeves, to relieve any congestion that may occur, in other words these act as vents where air will be easily circulated whether indoors or outdoors. Another feature of the polo is its double-needle sleeve cuffs and hem. 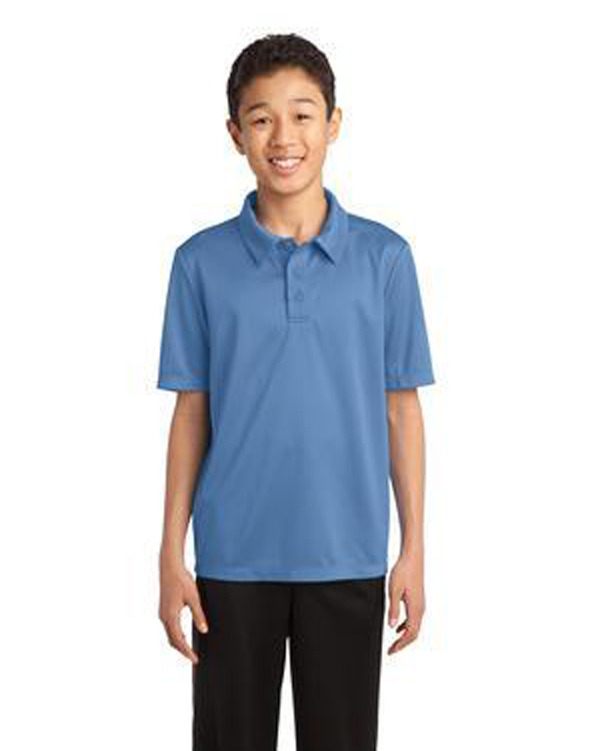 Sizes for the Port Authority® Youth Silk Touch™ Performance Polo vary from XS-XL. We took our legendary Silk Touch™ Polo and made it work even harder so that your children have comfortable and durable clothes. The durable Silk Touch™ Performance Polo wicks moisture, resists snags and thanks to PosiCharge™ technology, holds onto its colour for a great look that lasts and stands the test of time.